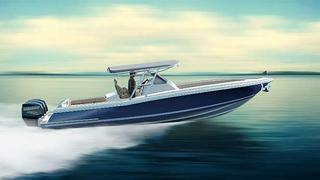 Chris-Craft has unveiled its new 10.4 metre Catalina 34 superyacht tender. The largest model in Chris-Craft’s Catalina series, the tender will boast a 3.3 metre beam and a 7.9 metre draft hull. She is expected to have a displacement of about 4,535 kilograms. The Catalina 34 will feature custom upholstered seating and a sunpad conversion for sun bathing, including a double sun lounger with arm rests and drink holders. A comfortable berth will be located below the forward helm seating. She will also feature a full beam sport top with sunshade, as well as hideaway seating and a convertible wrap to offer protection from the sun or shelter from unpleasant weather conditions. There will also be stereo and DVD equipment with a full-size sub-woofer. The superyacht tender will be equipped with a combination of twin and triple engines with a total power of 900hp. She will have a fuel capacity of 1,363 litres, making her suitable for long-range trips. The Catalina 34 is set to debut at the Fort Lauderdale Boat Show in October.